As you undoubtedly agree, one of the best parts of traveling is eating and experiencing local food. But finding the best local food in town is not so easy. San Francisco is a destination with a wide variety of restaurants catering different cuisines and offering their specialties. San Francisco can claim to be one of the city which has everything to offer, from dishes to snacks to drinks at some of San Francisco’s most authentic cafes and bars. If you feel you are feeling hungry in the mid of the hectic day or you craving for delicious food with reasonable price Kate’s Kitchen is the only place to go. Coffee shops popped up on every street of San Francisco, but blue bottle coffee is a place you can’t miss to grab iced coffee or macchiatos. While exploring San Francisco’s major attractions don’t forget to try mouth watering dishes at San Francisco’s popular cafe. 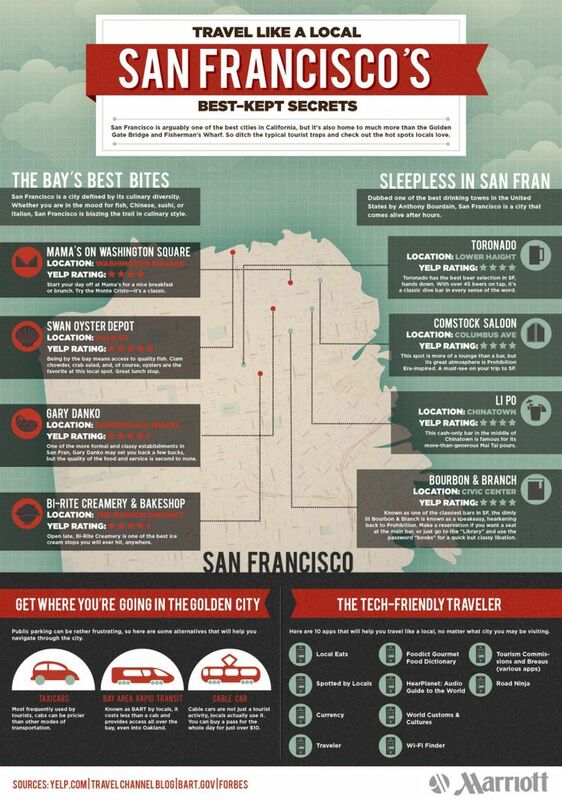 Treat your taste buds with the San Francisco’s food and drinks just by visiting these cafes and bars mentioned in infographic by Marriott.